Konrad Zindler (1866 -1934): Austrian mathematician. Rational ruled cubic surface with double line Oz. Zindler's conoid is the right conoid with directrix a cylindrical tangent wave with 4 branches (here, the wave ) and axis the axis of this wave. 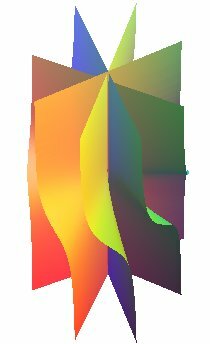 Zindler's conoid is also the right conoid with directrix a cubic of the type located in a plane parallel to its axis. 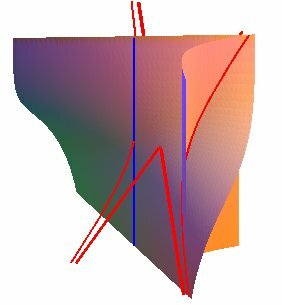 Any cylinder with generatrix Oz and directrix a rectangular hyperbola perpendicular to the axis cuts Zindler's conoid at hyperbola (in red) plus the axis Oz (in blue). Zindler's conoid is therefore the right conoid with directrix a hyperbola passing by its axis, the plane of which is not perpendicular to the axis. The complex scaling transforms it into Plücker's conoid, but these two conoids are images of one another by a real homography. 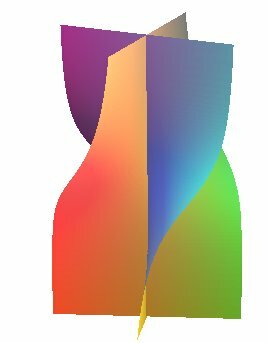 The case n = 1 gives the rectangular hyperbolic paraboloid .